An endoscope, a flexible fiberoptic scope with a light, is inserted through the mouth into the duodenum. 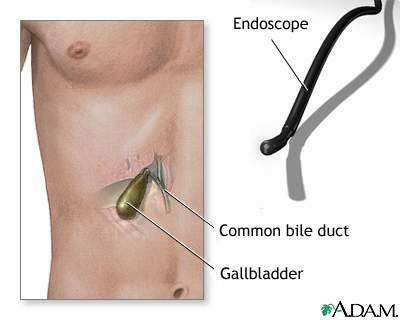 A catheter is advanced through the endoscope and inserted into the pancreatic or biliary ducts. A contrast agent is injected into these ducts and X-rays are taken to evaluate their caliber, length and course. Endoscopic retrograde cholangiopancreatography (ERCP) is performed to identify any narrowing, stones, or tumors in the pancreatic or biliary ducts.